Which Senator Has Passed the Most Laws? A not-so-shocking fact of lawmaking is that you are expected to make laws. So, which lawmaker can boast that he or she has been behind the passage of more laws in Congress than any colleagues? 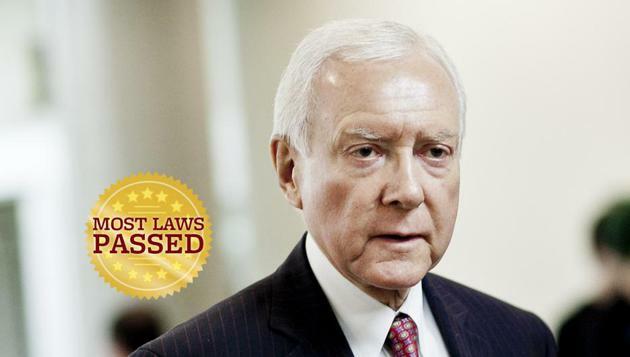 Out of the current class of senators, the honor of Most Laws Passed goes to Sen. Orrin Hatch, according to data from the Library of Congress. Hatch has sponsored or cosponsored 742 bills that eventually became law. For comparison's sake, the median senator, David Vitter, has seen 78 of the bills he sponsored or cosponsored enacted. Hatch has served in the Senate for 37 years. He's supported bills as diverse as a resolution to posthumously restore citizenship rights to Jefferson Davis (enacted by Jimmy Carter in 1978), to the Songwriter Equity Act, which would allow songwriters to be paid the "fair market value" of their work (Hatch himself has dabbled in songwriting). "I've always found that to be a successful legislator you need to fight for what you believe in and never give up trying to do the right thing," Hatch said in a statement to National Journal. "I look forward to continuing to work with my colleagues to support legislation that is in the best interest of Utah and our country." On the other end of the spectrum, four senators — Ted Cruz, Heidi Heitkamp, Tim Kaine, and Angus King — have each seen only one bill they've sponsored or cosponsored become law. Of course, the uniting factor is that they've all been in office for less than two years and, as with most of these metrics, it's skewed against rookie senators because they've had less time and don't have the seniority to see their bills become law. This metric also benefits younger Democrats — who served when their party had a majority in both houses and the White House — and veteran Republicans, who had an advantage during the George W. Bush years. Put simply, it's a lot easier to get bills passed when the tracks are greased. Longevity also plays a large factor. Each of the top 10 lawmakers has served in Congress for more than 30 years — since 1983 or earlier. Sen. Thad Cochran (who ranks in second on our Top 10 list) has served in Congress since 1973 — five years in the House of Representatives and 35 years in the Senate. On the reverse, Sen. Edward Markey joined the Senate in 2013, but served 37 years in the House before then. Working on a prestigious committee (or being Senate majority leader) also entitles you to shovel a lot of legislation through the pipeline. Along with former Sen. Arlen Specter, Hatch, and Sen. Patrick Leahy have taken turns chairing the Senate Judiciary Committee since 1995. Similarly, Sen. Carl Levin has traded off his chairmanship of the Senate Armed Services Committee with former Sen. John Warner since 2001. But just because a bill passes through your committee and reaches the Senate floor, that's no guarantee it will become law. Despite coming in ninth on the list, Leahy was less than thrilled about the ability for the current Congress, which has become intractably gridlocked, to pass laws. "There was a time when bipartisanship was the norm in the Senate. We came together, made reasonable compromises, and passed landmark legislation to fight discrimination, protect victims of crime, support American jobs and protect the most vulnerable among us," Leahy said in a statement to National Journal. "I have always sought bipartisan support for my legislative priorities, from annual appropriations bills to patent reform legislation, and from post-9/11 laws like the USA PATRIOT Act to such monumental initiatives as the Innocence Protection Act. Reaching across the aisle should be and still can be a pathway to success in the Senate." Levin, who came in third on National Journal's list, was less outspoken. He declined to comment on his legislative record, but Sen. Jack Reed praised Levin's work. "Part of what makes Senator Levin such a skillful, effective legislator is he is smart, tenacious, and principled but still willing to compromise and work on a bipartisan basis to get things done," Reed said in a statement to National Journal. "He is someone who carefully studies the issues and always shares the credit." Sen. Chuck Grassley, who came in fifth on the list, made the point that a senator's success isn't always about getting bills through the legislature. "Doing the job of a senator means passing legislation and sometimes stopping legislation," he told National Journal in a statement. "Both legislation and oversight are involved in my work for whistleblowers, and empowering whistleblowers and fighting fraud against taxpayers is a top priority for me." If you wanted to structure your entire legislative career in order to get in this Top 10 list (and who wouldn't? ), a good guide would look like this: 1) Serve in Congress for a really long time. 2) Serve during a time when your party has the majority and is able to pass almost whatever legislation it wants. 3) Serve on a committee — such as Finance or Appropriations — that, by its nature, authors a lot of legislation. 4) Be pragmatic about which bills you support, and consider whether they're likely to pass. Of course, the quantity of legislation passed does not always amount to quality. Congress passes its fair share of Commemorative Coin Acts and nonbinding resolutions each session. Ranking senators by the number of laws they have passed may seem like a facile measurement. And there are certainly factors that this metric doesn't take into account. 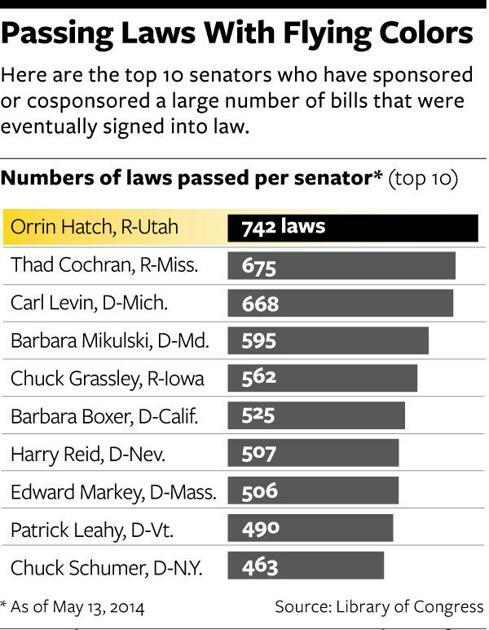 But it is useful in quantifying the sheer volume of laws these senators have seen enacted. It speaks to their longevity, tenacity, and pragmatism. Requests for comment from the offices of other senators who made the Top 10 — Barbara Boxer, Thad Cochran, and Barbara Mikulski — were not returned. This is the second part of National Journal's series on Senate Superlatives, which analyzes members of Congress by different metrics and grades their performance. You can read the first part in our series, about senators' vote attendance records, here. Emma Roller is a former staff correspondent for National Journal. Stephanie Stamm is a news artist at National Journal.